I couldn't do a better of job of explaining love than these words do. As a mom of six, I thought if I could teach my children to be loving and kind, then most of my job was done. So, a framed picture of these words of love hung on the wall in our home. It was the best child rearing tool I ever found. Before they could read, I would read it to them. As they grew up I would have them stand in front of it and read it out loud when they misbehaved. I told them to stop when they got to the one thing they were not doing and tell me. Sometimes they were impatient, sometimes unkind, rude, or angry. 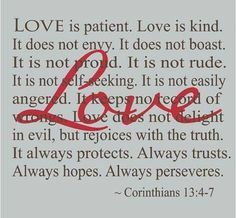 These words taught them what love looked like in actions and words. They learned that love is not a feeling, it is how we live. Valentines makes us think of chocolates and roses. However, February can be difficult for people who feel lonely or disappointed in love. This is the perfect time to make someone feel special. Valentines Day isn't just for romantic love. Let others know you appreciate them. Think of senior folks that would treasure a loving word or comforting gift. Don't miss Comfort Silkie's February - Feel the Love - Limited Time selections in lush Red, Pink, and Creme satins.